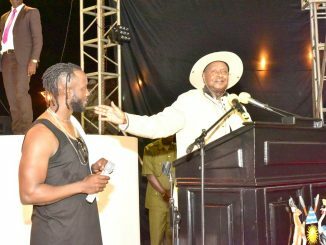 President Yoweri Museveni and Kabaka Ronald Muwenda Mutebi II shake hands as Katikiiro Charles Peter Mayiga looks on. Courtesy Photo/PPU. Buganda Kingdom has disclosed that the meeting on Friday, between President Museveni Kabaka Ronald Muwenda Mutebi II was to discuss the 2013 memorandum of understanding (MOU). 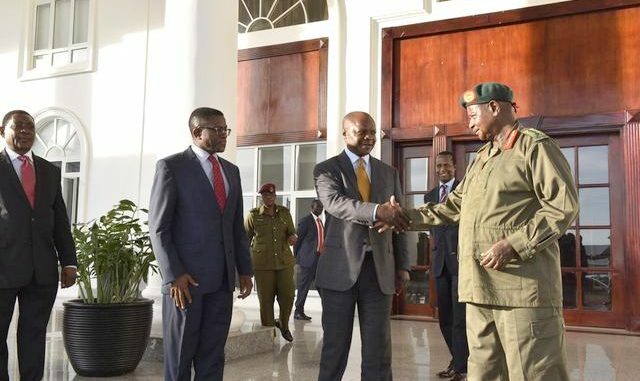 Photographs emerged on Friday of Kabaka Mutebi, accompanied by Katikkiro Charles Peter Mayiga and Prince David Wasajja meeting President Museveni at State House, Entebbe. 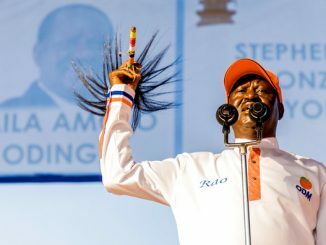 Senior Presidential Press Secretary Don Wanyama described the meeting as a courtesy call. In a press conference this afternoon at Bulange – Mengo, Noah Kiyimba, Buganda’s information minister told journalists that a wide range of issues concerning the Kingdom were discussed. He noted that Museveni and the Kabaka mainly discussed the implementation of issues outlined in the Memorandum of Understanding (MOU) signed in 2013 between government and the Kabaka. 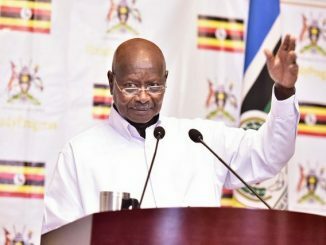 The MOU pertains the return of kingdom properties that were taken by the central Government after the overthrow of the 1966 attack on Mengo palace. A disagreement between Kabaka Edward Muteesa, who also doubled as ceremonial President of Uganda, and executive Prime Minister Milton Obote culminated into the military attack on the Kabaka’s palace on May 24, 1966. The Kabaka was exiled and Obote abolished the constitution and declared himself president. Minister Kiyimba noted the return of over 200 land titles by the central government over the last three years as one of the successes of the MOU. He however said that a number of other properties outlined in the MOU are yet to be returned to the Kingdom. On information that the Kabaka and Museveni discussed issues concerning the arrest of Rwenzururu King Charles Wesley Mumbere, minister Kiyimba without refuting or confirming these reports insisted that a number of issues had been discussed and that the Kingdom will at a later stage disclose other areas of discussion. Since the signing of the MOU, government has officially returned 293 land titles to Buganda Kingdom. The first batch of titles totaled 213 while the second batch was 80. Some of these land titles are for administrative buildings in the different counties and sub-counties. The other properties that the kingdom is still demanding return or compensation are the Jesa Farm on Mityana Road, Muteesa House in London, which was sold by the Milton Obote government, Plot 52 Kampala Road which houses King Fahd Plaza and Buganda Shares in Uganda Electricity Board among others. Kabaka Ronald Mutebi last visited State House Entebbe in September 2009 shortly after the riots that broke out in Buganda when he was blocked from visiting Kayunga district.